Hey there Seattleites, remember back in late fall 2009 right after McGinn got elected mayor when Alex Steffen challenged the City of Seattle to achieve carbon neutrality by 2030, and then the City Council adopted that idea as a 2010 priority, and then Councilmember Mike O’Brien convened an army of volunteers to address eight components of greenhouse gas emissions, and then the Office of Sustainability and Environment (OSE) contracted out a carbon neutrality study, and hey, have you been wondering what’s up with all that lately? Well, that carbon neutrality study by the Stockholm Environment Institute (SEI) is done, and it’s action packed. The proposed scenario would achieve steep cuts in greenhouse gas emissions in three main buckets: (1) transportation mode shift away from private autos: (2) greater energy efficiency in both vehicles and buildings: and (3) switching to less carbon intensive energy sources. The proposed scenario was intended to be aggressive, not over-the-top, but no doubt the above bullet points would take some serious doing. 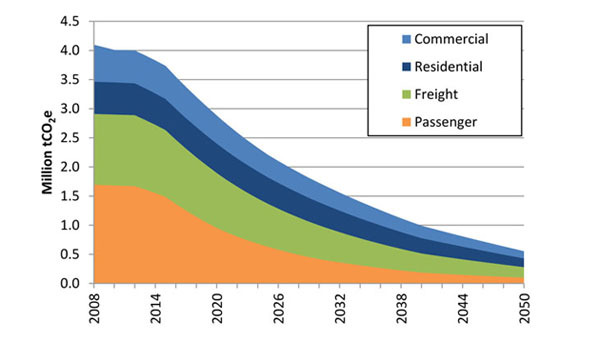 To achieve the required mode shift to transit, for example, the assumption was a five-percent annual increase in transit service from 2010 to 2020 followed by a constant annual increase (equal to the 2020 increment) thereafter. That adds up to a huge boost in transit service, and right now we may be headed in the opposite direction. The assumed scale of building energy retrofits is way, way beyond anything that has ever been attempted, and would require a massive up-front investment. Of course, that’s the reality of addressing climate change. We’re actually going to have to make an effort, imagine that. We could be—and should be—aggressively moving forward with the above strategies already.